When Marie asked me to take part in Watch this Lace I was thrilled and flattered, but also a tiny bit worried! Apart from trimming a hem, I've never used lace in my sewing before, so I needed to think long and hard about how to use it. I wanted the finished garment to fit in with the rest of my wardrobe and be something I'd wear, but as I'm not a particular lover of frills and flounces, I knew my version was always going to be on the reserved side. I finally decided to use the lace as a border/edging on a collar and front edges, using the Sewaholic Alma blouse pattern. My other consideration was that I wanted to use fabric from my stash for this make. After pulling out all my dressmaking fabrics and holding the beautiful, cream lace against them, nothing seemed to get me going. 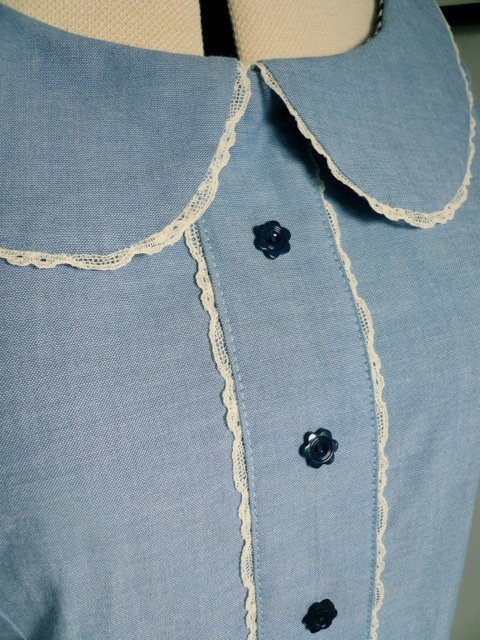 Purely by accident, a chambray coloured shirting happened to be on the bed at the same time, and when I held the lace against it they were a perfect match. Hoorah! I only just managed to cut the blouse out from the metre of fabric I had to work with though. If I'd had more fabric, I'd have made a button up version (anything to avoid a side zip) but given my scant allowance, I had to be creative. So I added a fake placket, which still gives the appearance of a button up blouse but is much simpler to sew. I carefully pinned my lace up each side of the placket, having first decided what level of lace was allowed to peep out. I then just top stitched down each lace trimmed placket edge. Easy peasy! Attaching the lace to the collar edge was a little more involved, but still pretty straight forward. As a final touch, I sewed small, flower-shaped vintage buttons down the front. With my last Alma blouse, I cut a size 10 in the bust, 8 at the waist and 4 at the hips. This time round, I cut a straight size 10. I had to take in the shoulder seams quite a bit and the hips a smidgen, but joy of joys, it goes over my head WITHOUT A SIDE ZIP!!! And because of the contour darts it's still nice and fitted. I now have a top that will blend seamlessly into my current wardrobe for a total cost of £3.50, which was the cost of the fabric. 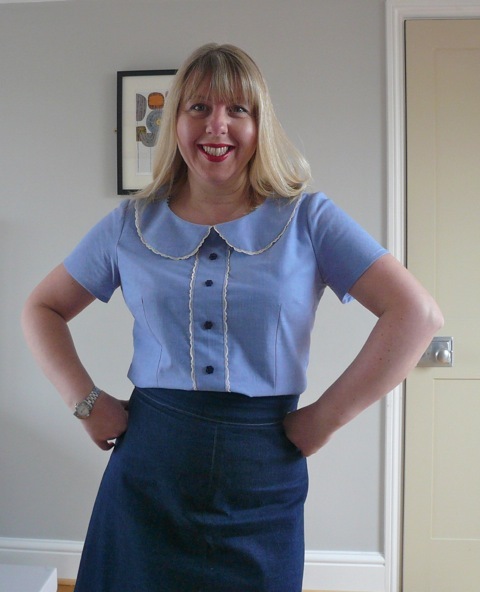 The lace was very generously donated by Marie, and the vintage buttons were from my stash. I'm so impressed at how Jane cleverly managed to incorporate the lace, without compromising her very clear sense of style! 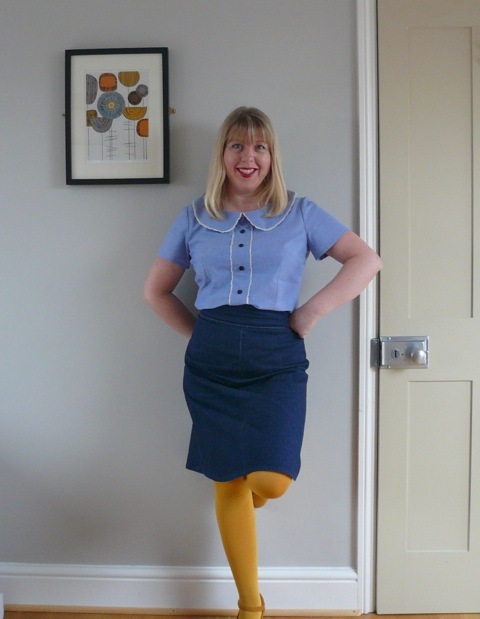 And don't get me started on the styling...the mustard tights are such a cool touch. Many thanks for playing along Jane! Next week, we're finally venturing across the pond to see what the super cute Sonja from Ginger Makes has in store for us! Very nice! Fell in love with the collar and buttons! Oh that is just gorgeous! I love the lace with the blue. It looks lovely! The buttons compliment the lace very nicely. Yes, this is very Jane! Wow, I just love the way you took that lace and made it your own, Jane. A great challenge, but you remained true to your own style! This series is fascinating- seeing how the same lace gets used so differently. Jane, your blouse is stunning - SO cute!! I really like the contrast of the blue with the cream lace. And the fake placket is genius. This looks like a blouse that will give lots of outfit options! How cute! Jane did such a great job making the lace fit into her style-- it really looks like something that she'll wear lots! So pretty! I love the little peek of lace--very subtle and classy. I'm loving these posts - they are just so interesting! This top is so sweet and so very Jane! I am getting in touch with you as I saw your blog whilst searching on the internet. Our website is going to be a website where you can upload your style and browse other peoples too. You will be able to connect with people all over the world and search for outfit inspiration from people who are your own size and who share similar tastes. We are looking for people to join the website prior to the launch date by filling in a few details and sending over some photos for their profile. If you are interested please get in touch as soon as possible...as it will be on a first come basis. We have a facebook page that has just been set up-so if you go to it you will be able to read more there. Jane, it looks so beautiful!!! It's great! Love it so much!!! What a lovely blouse. Practical but totally individual. I love your blouse, Jane! Simple, yet with such elegant details! I particularly liked how much the lace peeks through the fabric. Very well done! I'm more than late to comment, but this is freakin' adorable! Great job, Jane! 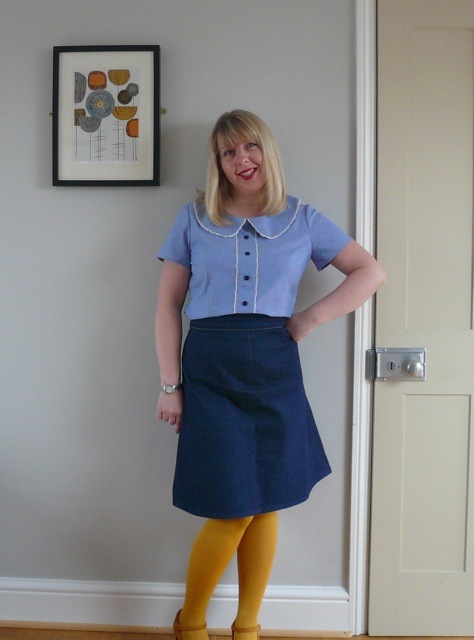 Please, can you tell us the name of the skirt pattern?